Finley discovered earliest, and implemented most potently, the phrase, “You promised.” The fact that most times I did not in fact promise means very little to either of us. When the plaintive request comes through, if it does not involve a trip to Disneyland or a kitten sized bar of chocolate, I tend to find someway to acquiesce. Lately this has involved many rounds of “Orphanage/Pet Shop” wherein we caretake woebegone woodland creatures and foster orphaned girls whose parents “didn’t make it” during the war. Often times I have my phone with me as I wait for an email response to some work related thing, but she’ll direct me to pretend it’s a walkie talkie and its presence becomes a part of the game. The other night she came to me as I was in the middle of researching materials for a project. 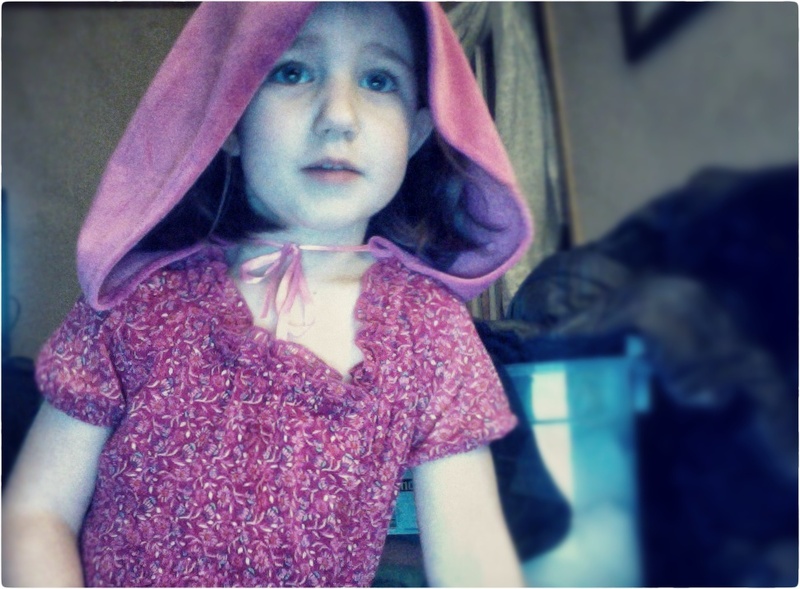 She was wearing her pink velvet cape, which makes her excruciatingly impossible to say no to. I felt my emotions begin to roil as the first pricks of resentment sprang for the imminent interruption, I loathed myself for not joyously dropping everything in anticipation of her desire to play. Despite resolving to forgive myself, I gave myself no mental credit for the activities we’d done earlier in the day, no acknowledgement for the yeses that had decorated the long stretch of winter break. I started to say, ” Can you give me a minute?” but she interrupted me. “But, mom, you promised.” Her eyes held mine. I drew a deep breath. She waited, scanning my face for some signal of which way I’d go. I lowered my eyes and then looked back at her. I retraced the day and thought about when I told her her that she couldn’t have cocoa and that I couldn’t do a project because I was taking her sisters sledding. There are days when my parenting decisions are based on sustaining a flow state, a yes here will keep the peace, a no there will preserve the schedule. Other times, like this caped request moment, I run plays through my head like a football coach at the tail end of the last time out. Sean’s voice tickles at my memory, “We can’t let her walk all over us. We have to establish some boundaries so that she understands that it isn’t always about her.” I can see a basket of folded laundry behind her and I hear the lasagna we prepped together bubbling in the oven. Her big sisters are playing happily on the XBox and Sean is away at a gig. I look back at those blue eyes beneath the cape..
“Oh, mommy thank you. You are going to be the 16 year old orphan, you’ve been doing it for years and years. I’ll be out in the storm, hurry, let’s go.” The throaty lilt of her voice is still unable to fully alight on the r sound, which makes her speech feel more feather then quill. It won’t last and so I rejoice in it, leaving any corrections we’ll need to do before kindergarten for months from now. I set my laptop aside and follow her upstairs. When we get to her bedroom she presses her fingers to her lips, “Shhh, I am going to be in the storm.” I nod and head quietly into her room. Looking around I get down on my knees and begin to set the stage for us—a baby blanket here with all the teddy bears, a pillow there with the bunnies, babies go over there and then a store counter against the wall. I call softly, “Are you ready?” She whisper-yells that she is. I wait and then go the door and call out in a British accent, “Hello? Is someone out there? If you are hurry and come in, you mustn’t risk being out in this storm!” I throw open the door and clutch my hand to my throat as she rushes past me. She dashes to the bed and rests her hands on the bedpost. The hood of the cape slips down, darkening her entire face. She begins a breathless tale of running from the evil people. I watch her feet, with mismatched socks by design, moving back and forth in excitement. Her elbow peeks out from the cape and light catches in dimple that growth spurts have not yet smoothed away. As she holds up her hands to indicate how many days she has been hiding, I smile. More dimples, vestiges of nail polish and a bit of green marker on the palm of her hand from coloring. I am so happy to be here with her, I reach out and press my finger into the dimple on her elbow. The cape wrinkles at her neck, deep, feathery folds of velvet open and close as she moves. I kiss her shoulder and say, “I love you.” She is undeterred. “Then, when I saw them go away, I told myself that if I could only make it to the lights, which are the windows in this pet shop orphanage, that I would be ok.” I smile. “I squeeze her arm and tell her again that I love her. A look of consternation crosses her face. She says, “Have they been here? The bad guys?” Then it hits me, there is no multi-tasking in playing, there is no need to define a moment if you are inside of it. This tendency I have for cataloging the things I do—the wins vs losses, am I the working-mom or doting dreamer, is bankrupt here. I pull a scarf from behind the dollhouse and sweep it across my shoulders. “Shh, we must go. We must away to the closet and hide. The evil ones approach each night after I feed the children. Come on, hurry, hide with me.” She looks up from beneath her cape, those blue eyes flash with excitement and joy. I don’t bother to assign exactly what is making her happy or plan what will come next. I just move with her to the closet where we huddle together, outsmarting the bad guys and cementing our alliance. More feather than quill. Love. So true. Another beautiful story birthed from a beautiful moment, Amanda. When my daughter was little, it was always “fairytale castle” that she wanted to play. And play, we did, not everytime she asked, but many, many times. The fairytale castle lives in the attic now, awaiting future grandchildren (way, way in the future). Now, we sit to play Scrabble or go outside to hit the tennis ball, and I find it very comfortable and fun, but I do miss those days when her imagination was firing in the ways that are unique to a young child. I admit that I sometimes found it exhausting, and thought I’d rather do anything than pretend to be that evil dragon yet again, but now I miss that dragon. He really wasn’t so bad. This is beautiful, Amanda. Such vivid images. My grandchildren and I play similar scenes – often involving Peter Pan, Captain Hook, Wendy, and crocodiles. We also love to sing some Broadway musical scores and act out the songs as we sing – kind of an expanded/unfettered/enhanced kareoke. Good call – to take time out to rescue the orphan. Did I play with them enough? I hope I did. Pictures show I did. Oh, I don’t want to make you cry. Then again, don’t the tears feel good sometimes? I bet you did play enough. And love enough. And laugh enough. Love you right back, sweet Alexandra. Amanda, you have an extraordinary gift with words. The imagery, the emotions, the moments, all exquisitely painted, sung and strung together with such beauty. Not only that, I can also relate to the push and pull of motherhood, where we precariously try to balance wanting to play with our girls and having to do the laundry list of things that are forever assigned to our roles as parents. But these moments with our girls are fleeting, and sometimes, even though it’s not the right choice to abandon our tasks, it’s still the best choice. my word do I love your writing.